James Forman was born in Chicago on 4th October, 1928. After high school he entered the United States Airforce and fought in the Korean War. When he returned to the United States he studied at Roosevelt University, graduating in 1957. Forman worked for the Chicago Defender and reported on the civil rightsstruggle in the Deep South. 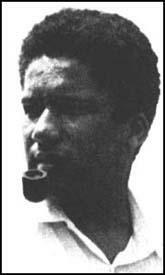 He joined the Student Nonviolent Coordinating Committee (SNCC) and in 1961 was appointed as its executive secretary. In this post Forman controversially began to demand that the African American people should be given $500 million in reparations for the injustices of slavery, racism and capitalism. Forman served as president of the Unemployment and Poverty Action Council (UPAC) before returning to his academic studies, receiving a M.A. from Cornell University (1980) and his Ph.D from the Union Institute (1981). Foreman has also written several books including Sammy Young Jr.: The First Black College Student to Die in the Black Liberation Movement (1968), The Political Thought of James Forman (1970), The Makings of Black Revolutionaries (1972) and Self-Determination (1985). SCLC decided to devote almost all of its organizational energy to a massive right-to-vote campaign, with headquarters in Selma. SNCC, already based in Selma, agreed to cooperate in this new venture. But disagreement on such key issues as concepts of leadership, working methods, and organizing voters for independent political action versus Democratic Party politics, bred conflict between SNCC and SCLC staffs in Alabama. As the vote campaign intensified, accompanied by innumerable arrests and beatings, the proposal emerged for a march on the Alabama Capitol to demand the vote, as well as new state elections. Basically SNCC was opposed to a Selma-Montgomery march because of the likelihood of police brutality, the drain on resources, and the frustrations experienced in working with SCLC. At a lengthy meeting of its executive committee on March 5 and 6, SNCC voted not to participate organizationally in the march scheduled for Sunday, March 7. However, it encouraged SNCC staffers to do so on a non-organizational basis if they so desired. SNCC was also to make available radios, telephone lines, and certain other facilities already committed by our Alabama staff. Then we heard that Dr. King would not appear at the march he himself had called. Without his newsworthy presence, it seemed likely that the lives of many black people would be even more endangered. We therefore mobilized three carloads of staff workers from Mississippi, two-way radios, and other protective equipment. At our national office in Atlanta, a group of SNCC people - including Alabama project director Silas Norman and Stokely Carmichael, whose subsequent election as SNCC chairman was largely the result of his work in Alabama - chartered a plane rather than make the five-hour drive to Selma. Since we had heard of King's absence only after the marchers had begun to assemble, none of SNCC's people were able to arrive for the march itself. But it seemed important to have maximum support in the event that violence developed that evening. While our various forces headed for Selma, we tried repeatedly, but unsuccessfully, to contact Dr. King, to find out his reasons for not appearing and to discuss the situation.